I found this article today and wanted to share it, not often you see guy quilters! 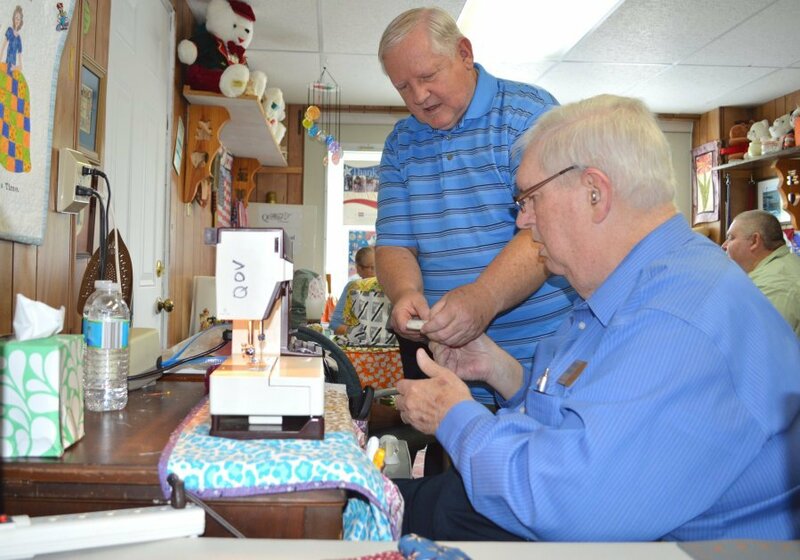 Photos by Maggie Jones/News Sentinel From left, John Lewis, Dennis Taylor and Chuck Calhoun stand together in Taylor’s sewing studio where the group meets every week to make quilts. 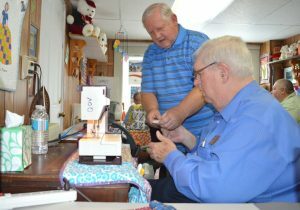 While quilting has often been seen as a hobby for women, a Knoxville quilting group composed of men is breaking that stereotype for a cause they believe in. 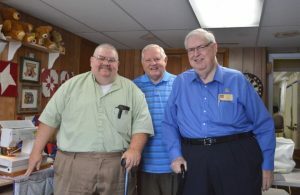 Dennis Taylor, John Lewis, Chuck Calhoun and Rick Finchum, who call their group “The Guy Quilters,” meet in Taylor’s sewing studio in Halls every week and make quilts for the nationwide organization Quilts of Valor, which gives quilts to veterans. They are also members of the Smoky Mountain Quilters of Tennessee. Taylor, who got involved with Quilts of Valor in 2012, decided to tackle the craft after his wife volunteered for the organization. “After a while, I kind of figured out it didn’t look as hard as I thought it might, so I started making quilts myself,” said Taylor. He now serves as the East Tennessee Coordinator for Quilts of Valor and will be the show chair for the upcoming Smoky Mountain Quilters Show on June 17-18. He, Lewis and Finchum will submit quilts in the show to be judged. 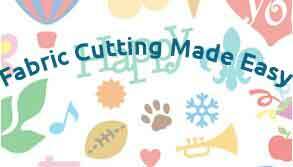 The event will also feature Quilts of Valor and Ronald McDonald House quilts on display, vendors, quilt sales, a sewing circle where attendees can help stitch quilt blocks for Quilts of Valor and more. Taylor said at first it was a bit nerve-wracking to join the Smoky Mountain Quilters and work with Quilts of Valor. After getting involved, Taylor began to recruit other men he knew to help make quilts for Quilts of Valor. He learned that Lewis had been quilting since he was child because his mom, grandmother and aunt taught him how to sew and cook at a young age. “My mom told me the reason she taught me how to do all that stuff was so when I decided it was time for me to get married, I could get married for love. I didn’t have to have someone take care of me,” said Lewis. Taylor also recruited Finchum, who has completed several quilts, and Calhoun, who played football for Florida State and has finished his first quilt. “(Calhoun) is the last guy you’d ever expect to make quilts,” said Taylor. “(Taylor) kind of strong-armed me,” added Calhoun as Taylor and Lewis laughed. While the group has varied degrees of experience when it comes to quilting, their motivation for learning and practicing the craft for Quilts of Valor is the same: serving and giving thanks to fellow veterans. It’s personal for Taylor, Lewis and Calhoun. Each of them served in the military. Taylor and Calhoun served in the Army in Vietnam in the 1960s and 70s, and Lewis was an Army medic in Germany from 1979-1983. In addition to making quilts, they have presented them to veterans for Quilts of Valor. Chuck Calhoun works on a quilt square that will become a part of a Quilt of Valor. Calhoun describes presenting quilts to veterans as “tear-jerking” and “heart-wrenching” because he knows what they have gone through. “It gives you a feeling in here,” said Lewis, gesturing at his heart, “that you just can’t get any other way … it’s soldiers taking care of soldiers. Taylor said he is looking to expand the Guy Quilters if more people want to join. They need extra help. 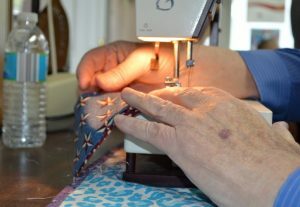 The East Tennessee’s Quilts of Valor volunteers can’t keep up with the demand. Nationally, there’s around 7,000 Quilts of Valor volunteers and more than 137,000 quilts that have been awarded to veterans, according to Taylor. Last year, Quilts of Valor gave 761 quilts to veterans in Tennessee, and there are 22 groups in Tennessee who make quilts for the organization. For information on Quilts of Valor, visit http://www.qovf.org/, and for additional info on the Smoky Mountain Quilters, visit http://smokymtnquilters.com/.